Reasoned criticism of the Church of England is always welcome: as a human institution it boasts of no perfection; as a provisional branch of the Catholic Church it makes no claim to eschatological fulfilment; as a temporal organisation it is riven with division, deficiency and dishonour. And as a mere man, the Archbishop of Canterbury is steeped in failure, frailty and fallibility. Which is why The Times‘ latest attack on his spiritual integrity, missiological preference and theological priorities is both ill-conceived and graceless. It is a curate’s egg of a piece by Tim Montgomerie, expressing certainly some valid insights into the political culture that may be seen to pervade the House of Bishops, but evidencing profound ignorance of the establishment, organisation, governance, ministry and mission of the Church of England. The Archbishop of Canterbury is not a pope: he has no pre-Reformation buttons to press or levers to pull by which he may make the Church in his image (thankfully). He doesn’t bestride the Anglican Episcopate like Margaret Thatcher straddled her Cabinet: he can’t sack the “wets” and promote those who are “one of us” as he sees fit. He has been in the job for barely two years, and is working pragmatically with what he inherited from preceding governments and archbishops. And, pace The Times, the consensus across the irreconcilable wings of the Church and antithetical jaws of the world is that he’s doing a rather good job. You may not always agree with him, but his sincerity, values, conviction, compassion and capacity for the Kingdom are manifest and appreciable. He is the superintendent of all ecclesial matters in the province of Canterbury, with direct responsibility for 29 dioceses; oversight of all other bishops; obligations to preside over sundry conferences, councils, societies and synods; and the duty to commune personally with the 38 self-governing churches, 500 dioceses, 30,000 parishes and 64,000 individual congregations across 164 countries that constitute the the Worldwide Anglican Communion. He has dedicated cumulative months to visiting every province, greeting his brothers and sisters with a holy kiss, worshipping where there is joy and weeping where there is grief. He has walked through burned-out churches, and waded through the rotting bodies of those who have died for their faith in Christ. He has stood at the side of mass graves, consecrated the ground, listened to the cries of the lonely and bereft, bowed his head and wept. 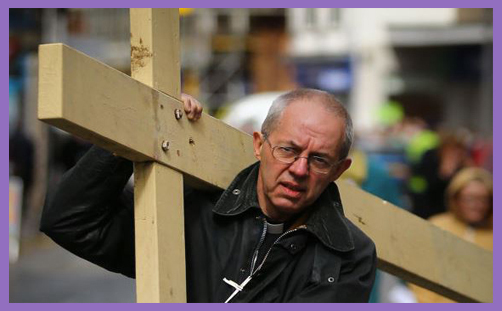 Given this global pastoral mission of compassion, this burden of ecclesial jurisdiction, the passion for peace and reconciliation, and the complex liaison with strained communities with competing faith perspectives across the Communion, for The Times to opine that “Justin Welby should recognise the benefits of the wealth-producing private sector and curb his love of big government,” seems crass, shallow and uncharitable. The Archbishop of Canterbury is not a theologically-illiterate or politically-naive halfwit, with no knowledge of the private sector, no grasp of economics, and no understanding of the incremental tensions between individual liberty and state coercion. When The Times lectures this Archbishop with its shoulds and oughts, they evidence nothing but their own theological triviality. The Church expresses its ‘core business’ of worshipping God and calling people to Christ by trying to exemplify God’s desire for solidarity throughout his creation. So you will find the Church offering debt advice courses, feeding and housing the homeless and vulnerable, standing with those who are sick or face injustice (p38). This is simply untrue. Archbishop Justin states unequivocally: “There have been numerous and varied attempts by our governments to rescue cities in decline” (p32), with the conclusion: “Nothing has really worked so far” (p33). He goes on to criticise President Hollande’s tax-and-spend policies: “It is equally hard to find examples of other countries where economic problems are solved with purely economic solutions. France continues to struggle despite increases in government spending and taxation” (p34). And says unequivocally: “Nor can governments by themselves solve the problem. More dependency on cash injected on the basis of some grand plan or strategy, or dependency on the collateral benefits of a free market, are not sufficient answers” (pp36f). He expands: “..and the market is an extraordinarily efficient mechanism of distribution in a complex society” (p46). Beveridge wrote a second, less well-known report called ‘Voluntary Action’, which reflected his concern that the state must not take on all responsibility for care of the weak, the vulnerable or the unfortunate. The state is good at being universal, but it can’t be personal. The state can’t put its arm around you. The state can’t welcome you into a church and say, “You matter.” The state can’t hand you support in a way that is not condescending, or the creation of dependency. There need to be strong and varied intermediate structures of voluntary action. Yet in the same book, he writes: “..for most people the major source of stability and hope is found from engagement in a worthwhile occupation. This gives self-respect in enabling people to earn a living and provide for those around them.. Many people have boring work, or work that they don’t enjoy. But no work is almost invariably even worse.. When God created us, he intended us to work, not to be idle” (p28). Further: “..without recognition of the uniqueness of each locality, and the gifts and challenges that its history have moulded, a top-down imposition of policy will never gain the community ownership – or common bond – that is needed to deliver the practicalities of a society demanding solidarity” (p51). ..the current Secretary of State for Work and Pensions, Iain Duncan Smith, has spent hard years turning himself into a leading and principled expert on welfare, its effects and shortcomings. He is introducing one of the biggest and most thorough reforms of a system that most people admit is shot full of holes, wrong incentives, and incredible complexity… The Work and Pensions Secretary is also attempting this series of reforms at a time when, through no fault of his own, government finances are more squeezed than at any time in peace since the 1930s. And reforms cost money. So he also has to manage a considerable task. That is why in my letter I was careful not to imply wrong motives or anything like that. Having met him, I am absolutely convinced he is trying to do something that he knows more about than most – and with the best possible motives. The stance that Archbishop Justin has taken against debt – whether personal, in the context of payday lending and credit union alternatives, or corporate, in the context of his involvement in the Parliamentary Commission on Banking Standards – is very well documented. One must seriously question the spiritual discernment of the Christian who believes this constitutes building on sand. A primary purpose of the Church of England is to speak truth to power. It does this whichever party is in government, for that is part of its mission. There may be criticisms of policy and rifts over outcomes, but from this Archbishop of Canterbury it is not superficially tendentious, prejudicially one-sided or in any sense party political. The Times owes Justin Welby an apology. Either that, or a conciliatory invitation to write an extended piece on the miraculous nature of Jesus Christ.